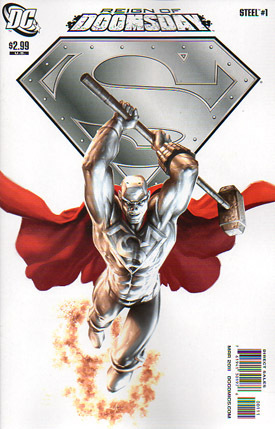 Steel's nightmare is revealed, he always thinks back to the time Superman died and he was in hospital unable to help. But the dreams that taunt him were perhaps a vision of the future as Doomsday is back and only Steel is around to stop him. Freshly awakened from his coma after battling Atlas, John suits up in a scene reminiscent of the day Superman died. His mind wanders back to elements of the legendary battle and the birth of the four Supermen... Superboy, Eradicator, Cyborg and Steel himself. Natasha warns her uncle that Superman's death and rebirth were a series of unrepeatable events, not everyone can be Superman. While Steel battles Doomsday after his mysterious reappearance, Natasha concentrates on helping survivors of the attack get to safety. Doomsday seems to have a specific agenda, he's returned to Metropolis, not for Superman, not for the thousands of Kryptonians, but for Steel himself. Through the battle Doomsday learns how to evolve his protruding bones into metal mimicking Steel's armor texture and flight. The battle continues until Steel is able to pierce Doomsday's skin. Taking a quick opportunity, Steel infects the behemoth with his new Nanobyte technology. To Be Continued in Outsiders #3. Story - 4: The action and references to the Death of Superman are top notch. There is a great deal of devotion to that storyline that made to tie the déjà vu effect feel fresh and not repetitive. The disappointment is that there is no reference to HOW or WHY Doomsday got out from wherever he was, and for readers who never picked up Steel's original book it doesn't really go into John's history or abilities at all. If you overlook those two points the story is very enjoyable if predictable... Surely instead of "Grounded" this is the story that could put Superman and his extended cast back on the map. Art - 5: The art is very solid. Doomsday looks brilliantly deadly and nothing in the story seems to suffer while elaborating on the past. The battle layouts look fantastic and, though sometimes Ed Benes work can seem to be 'going through the motions', this issue just screams 'event'. Cover Art - 4: It's been so long since Steel appeared on a front cover, that there was nothing that Alex Garner could do that could be wrong. This rendition of Steel looks brilliant, Garner has done a fantastic job.